From left: Carlee Gochenaur, Kayla Seyfert, and Emma Lerchen. 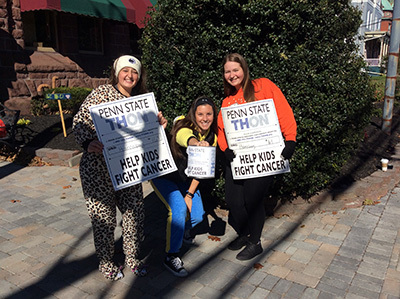 Three Penn State Harrisburg students were in the Halloween spirit as they were at Emaus and Union streets in downtown Middletown collecting donations for THON on Friday, Oct. 28. Billed the largest student-run philanthropy in the world, THON - known formally as the Penn State IFC/Panhellenic Dance Marathon - is a year-long effort to raise funds and awareness for the fight against pediatric cancer. Since 1977 THON has raised more than $137 million for Four Diamonds at the Penn State Hershey Children's Hospital. The three students who were collecting in Middletown are Carlee Gochenaur, a sophomore from Harrisburg; Kayla Seyfert, a senior from the Annville/Lebanon area, and Emma Lerchen, a freshman from Annville. To learn more about THON go to http://www.thon.org/. Disaster declaration in Londonderry Twp.